Learn To Drive - Learn to drive safely and save on driving lessons. Our introductory offer of four driving lessons for £69 allows you to check out your driving instructor's skills. If you learn fast then think Driving School and the unique program reduces the number of driving lessons you need and will make learning to drive relatively cheap. Lines open from 8am to 7pm everyday. 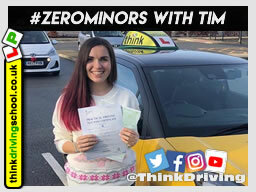 Alternatively, please complete your details in the form below or email think@thinkdrivingschool.co.uk and think will get the instructor that covers your area to call you.